It’s a beautiful Saturday as I write this and so far no dreary blackouts have happened today yet (thankfully). As it is in most Philippine cities, there is a rotative blackout happening, for what reason, I’m still not sure. 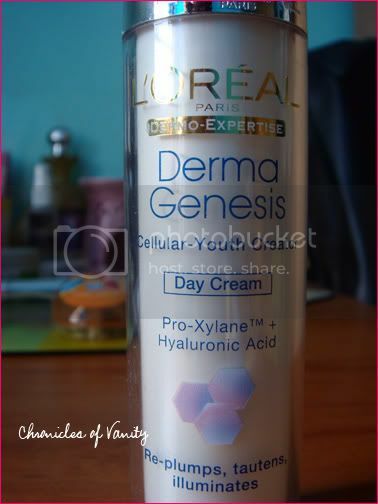 This morning afternoon when I woke up, I was struck with realization that I’ve got a huge pile of beauty products I’ve neglected reviewing, which is why today, I’m sharing with you my thoughts on yet another L’oreal product (I always rely on L’oreal for skincare, BTW), Derma Genesis Cellular Youth Creator Day Cream, a product I won from Frances’ OK! Contest last December. The origin of skin youth lies in the creation of new cells. Over time, skin becomes poorer in vital substance and generates less new cells. For the first time, skincare with Pro-Xylane and Hyaluronic Acid helps create new cells for visibly young skin. This unique combination is developed to infuse the skin with vital substance and to favor the new creation of cells. It’s always tough to go wrong with any L’oreal product (especially skincare). I admit that the most rational reason for my love for it is because it’s not expensive, very accessible to us working women who can just pass by any Watson’s store and purchase such. Add to that the range of skincare products they have and you have yourself a good brand to trust. The first thing I noticed was the scent, which smelled really clean and girly. It’s not the usual L’oreal scent and I kinda like it even better! Nothing against the products I’ve been using before, which are also L’oreal, but this kinda makes me get that certain glow. Maybe it’s not really innate in the product, who knows, but my skin probably loves it that I’m using something new and that made it glow even more than it already was. The packaging! I love how the product is stored in an airtight bottle, which you have to twist and pump in order to obtain. Locally available and in lots of Watsons’/SM beauty branches, too! Wearable for daytime and nighttime. I had the luxury of using it as a day cream despite sans SPF as I normally have a separate sunblock anyways. My oil blotting usage didn’t go up, YAY! A little goes a long way. During the first time I used it, I accidentally pumped too much so my face was really moist. I learned that the best amount is the size of a pea. This is the answer to my no-anti-aging woes from last time. I’ve no idea how much it is but I saw it’s being sold for Php 900 online. It ain’t exactly very expensive but there are cheaper alternatives. Nothing much, really. I’m a happy camper with this one! Will I buy one? Yes! This saves me the hassle of using two different creams for day and night.